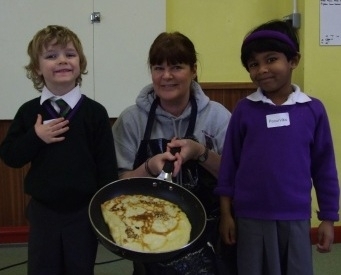 Nursery children enjoyed making pancakes yesterday. They all helped to mix the ingredients together, whilst the Nursery staff cooked them. Once they were ready, the children chose their topping and began the tasting session. As you can see, they went down a treat! Billinge House also enjoyed a special assembly given to them by Mrs Waddicor. She brought her trusty frying pan along and showed the children how to make the perfect pancake. She asked the children what their favourite pancake topping was, and let us into a small secret – she puts LOTS of sugar on hers!